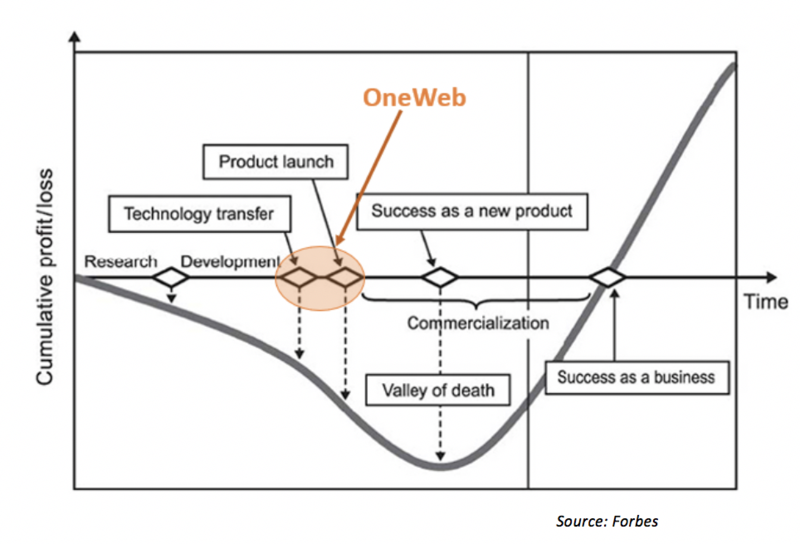 Home > The Bottom Line > Can OneWeb Cross the Valley of Death? Can OneWeb Cross the Valley of Death? OneWeb, with its FCC filing approval in 2017, re-introduced the concept of offering global, affordable, high speed Internet with a bigger – and in some respects – better LEO satellite constellation than its predecessors. In terms of size and (advertised) capability, OneWeb is leading the LEO Constellations 2.0 era. In many ways, the future trends of the industry – directly or indirectly – depends on the success of OneWeb as it sets out to open new doors, raising confidence amongst investors in similar new ventures. Amidst other players in this domain (past and present), OneWeb has accomplished a significant feat by raising the most funding – $1.7 billion – offering it a tremendous benefit over other similar LEO constellations. However, despite this notable amount, the question remains – is it enough to support and sustain this mega constellation, or is it just buzz and hype? Despite the diversity in various differing business models, all new ventures follow a similar general trend, which is encapsulated in the start-up lifecycle. One of the biggest challenges for most start-ups is to endure and survive the “valley of death” phase. This is the period when the start-up idea starts to move from conceptual phase to the implementation stages. NSR considers OneWeb is currently placed between the technology transfer and product launch phases and will soon enter the said valley. 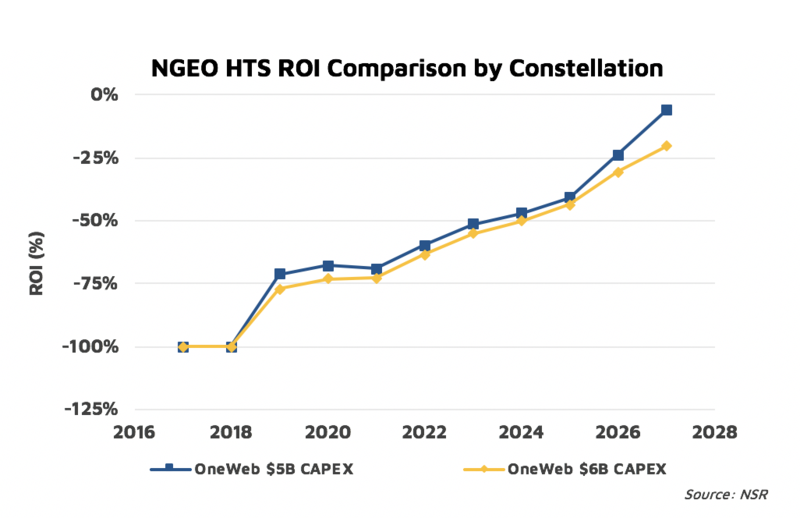 NSR’s Satellite Constellation: A Critical Assessment report delved deep into the business case for various satellite constellations, including OneWeb. At the time of publication – NSR estimated a total CAPEX of over $5 Billion for OneWeb- which is $2 billion over the originally expected total CAPEX of around $3 billion. Considering this CAPEX value, a total available funding amount of $1.7 billion to date and a valuation of capacity as well as service revenue streams from various applications, NSR estimates a negative ROI over the next 10 years, which is attenuated further with the recently announced (and later retracted) confusing news of a $6 billion associated CAPEX. This analysis, for both cases, also assumes additional financing – enough to keep the cash flow positive during the forecasted time-period – at a 5% annual interest rate. In addition to the (relatively) easily quantifiable challenges, OneWeb also faces obstacles related to mass production. OneWeb’s optimistic plans to launch its satellites every 21 days also creates added risks such as loss of a substantial part of their system in case of launch failures, as well as potential delays due to launch constraints. The dismissal of landing right requests (such is the case in Russia) also poses a significant threat to the success of OneWeb, as does the heavy recurring cost of fleet replenishment every 7-10 years. The success of OneWeb (like any other new venture) relies greatly upon its commercial ability, which further hinges on factors like technology, demand and market-readiness. For OneWeb, technology readiness is currently estimated at TRL 7 – 8 with system development in progress and launch and operations expected to start in early 2019. In terms of demand, OneWeb’s promised services are a DRL (Demand Readiness Level) 8 – 9, which translates to building the adapted answer to the expressed need in the market. Market readiness, however, is a probable barrier for OneWeb. Put simply, the market readiness level depends greatly on the ease of acceptance of the service at the proposed and desired prices. With the ever-growing expenses associated with development and launch of the system and aforementioned challenges, can OneWeb cross the “valley of death” unscathed and stay afloat to provide affordable services? Projects like OneWeb aspiring to create new standards, and, in the process, help create and boost new business models and industry trends (such as higher efficiency propulsion systems and cheaper launch solutions) are a refreshing and vital change in a traditionally conservative industry. Achieving its full potential can not only provide affordable Internet access to remote areas of the world and offer benefits in education and healthcare, but also help open new doors in both upstream and downstream segments of the industry. Funding of $1.7 billion is a significant achievement for OneWeb and should be capitalised upon efficiently, to avoid it from becoming its sole achievement and from suffering the same fate as other similar start-ups that closed after burning away significant amounts of funding. However, it is imperative that lessons learned from previous unsuccessful attempts are considered to refine OneWeb’s and similar ventures’ future business models, and in the process, cross the valley of death to become a successful business.